Last semester, several Skidmore theater majors attended study-abroad programs where they studied theater and many other disciplines off-campus. Below are the personal accounts of two Juniors who went abroad in the fall. Nothing bonds people quite like time-consuming and labor-intensive work. No sarcasm intended. My semester at the British American Drama Academy (BADA) was spent reading plays, memorizing lines, practicing (stage) punches, and stressing with fellow students about the amount of work we had and if our scenes were “ready.” Yes, there was stress, but there was also an incredible amount of passion. Spending my week day-in and day-out working with the same 15 people (30 in the whole group) caused a really unique ensemble dynamic to develop over the program’s relatively short 8-week class period. Scene study classes in Shakespeare and High comedy were an incredible opportunity not only because of the invaluable feedback of BADA’s experienced and knowledgeable teachers, but also because those classes became a space where everyone was excited for their work and the work of their peers, and nobody was afraid to take risks. Seeing the growth of my classmates, being so proud of their work, and knowing that they felt the same about my growth was extremely rewarding and changed the way I think about collaborating. After spending the first eight weeks of the program developing skills in analyzing a scene, movement, voice, physical comedy, improv, and more, we were then able to apply those skills to a fully realized production during the last 5 weeks of the program. Being able to work with a professional director and create theater solidified just how much I had learned during the first eight weeks, and taught me how to apply those skills to create art. It was great to end the program by seeing all my classmates thrive in the productions they had been cast in, and we supported each other from first rehearsals to bows. Of course, the fact that BADA’s program is located in London was pretty special too. Being in a city that is overflowing with art, history, and culture was perhaps overwhelming at first, but only because there were too many exciting things to do—not the worst problem to have during a semester abroad. Weekends were often spent at museums, parks, afternoon tea, or a meandering exploration of a new part of London. As a program, we saw one theater production a week that we then analyzed in our Dramatic Criticism class, but many students (myself included) took advantage of the huge amount of theater London has to offer outside of these program-wide trips. The number of productions I was able to see taught me as much about the theater as my classes did. My semester abroad was a lot of work, and certainly at times the adjustment was nerve-wracking, but with the friends I made, lessons I learned (theater and otherwise), and the amount of fish and chips I ate, I would not change a thing. Audrey Erickson was accompanied at BADA by several other Skidmore students: Matt Clyne ’20, Caollin O’Connor ’20, Liel Dolev ’20, and Amelia Power ’20. Dolev is still attending BADA this spring, along with Hannah Curtis ’20, who just began her semester abroad. 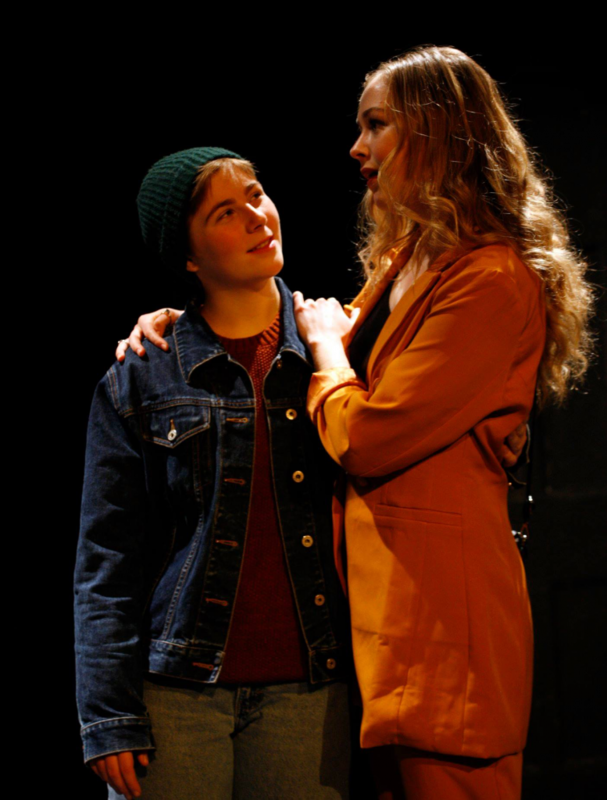 Audrey Erickson ’20 preforms in Shakespeare’s Twelfth Night at BADA, 2018. Photo by Simon Annand. This past fall, while studying abroad at Trinity College Dublin, I signed up for the student-run theatre and performance club aptly called the “DU Players.” With the sign-up came a shiny membership card (if you want to see it, ask me to show you!) and six individual auditions, one for each upcoming performance. I was cast as Rachel Crabbe in “One Man, Two Guvnors,” a contemporary British retelling of the Goldoni farce Servant of Two Masters, and it was certainly a difficult show to work on: the process was three weeks long, like we do at Skidmore in the lab processes, but throughout these three weeks we only held 35 hours of rehearsal! Needless to say, the chaotic nature of the show yielded a strong bond between the cast, and I met some of my best friends while abroad while working on this production. The one class I took in the Drama course also was a catalyst for close friendships – the course was Principles of Devising, where we studied and practiced various methods of collaboration. In this class, we split into groups and devised our own pieces, and this piece is the basis for my upcoming New Works Lab! One might think I was busy as a bee, but in fact I had more free time at Trinity than I’ve had in my entire Skidmore career. Except one seminar-style course, all my classes at Trinity were huge lectures, making it easy to sit back, relax, and take in the information; this also gave me time to explore Dublin, organize my pseudo-adult life, and attend numerous performances, museums, and events. All in all, my semester abroad was a full experience, a perfect balance of low-pressure academic learning paired with discovery: of Dublin, Ireland and of myself. 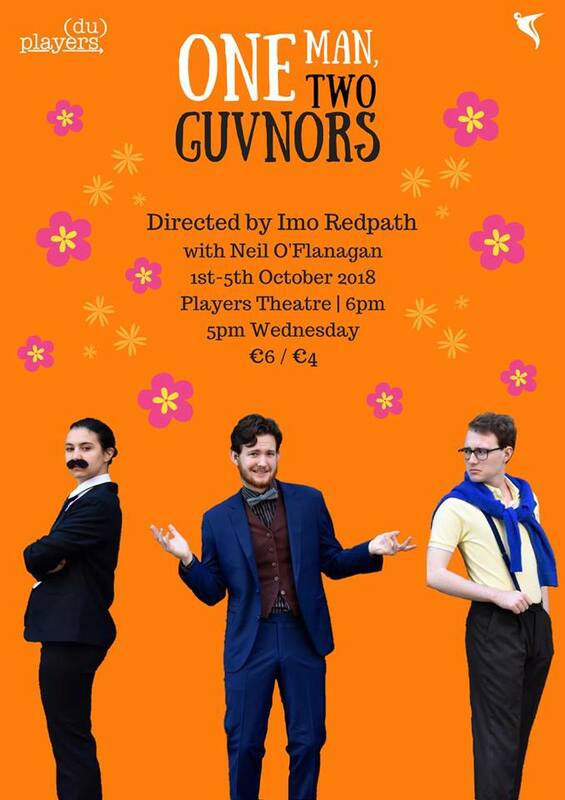 Cara Geser ’20 in a poster for the DU Players’ One Man, Two Guvnors at Trinity College Dublin, 2018. Curated and edited by co-editors-in-chief of STLN Kallan Dana ’19 and Philip Merrick ’19.